Surrounded by national forest, beautiful historic Timberline Lodge lies 60 miles east of Portland on Mount Hood’s south side, forming the heart of a mountain paradise with year-round adventures. Historic Timberline Lodge provides a taste of the past, with handmade furnishings and hand-painted artworks in beautiful period-decorated rooms. Free tours and activities. Reserve rooms at Timberline by calling 1-800-547-1406. Timberline Lodge is open all 12 months of the year. Located 60 miles east of Portland, Oregon on the Mt. Hood Scenic Highway. Timberline Resort offers snow sports, mountaineering, sightseeing, hiking, mountain biking, and tours. From crackling hearth fires to Express Chair Lifts, Timberline Lodge offers a unique, inviting experience. Declared a Historic National Monument in 1977, Timberline is open all year for skiing, snowboarding, hiking, sightseeing, and more. Timberline Lodge is located less than 60 miles east of Portland; take US26-E (Mount Hood Scenic Highway) to Timberline Lodge Road. The Lodge sits on the south face of Mount Hood at 6,000 feet. • Stunning Mt. Hood, Oregon’s tallest peak at 11,249 feet. • 3,690 vertical feet of snow sport area featuring 41 snow sport trails, 9 lifts, and freestyle terrains. • Magic Mile Sky Ride takes visitors to 7,000 feet for spectacular views of Mt. Hood, Mt. Jefferson, and the Palmer Snowfield glacier. • Networks of hiking and mountain biking trails. Timberline Lodge was built in the 1930s as a Works Progress Administration project during the Great Depression; this entire crafts building was constructed and furnished by hand. The lodge is well-known for film appearances, notably Kubrick’s 1980 The Shining. Seventy guest rooms can be reserved year-round, including Fireplace, Corner, Twin/Queen, or Chalet. Handmade furnishings and artwork lend a unique and rustic charm. For reservations, call 1-800-547-1406. A dining room, pub, and bistro are all housed within the Lodge; two other restaurants sit nearby. Local crafts and native art can be purchased in the Timberline Gallery. 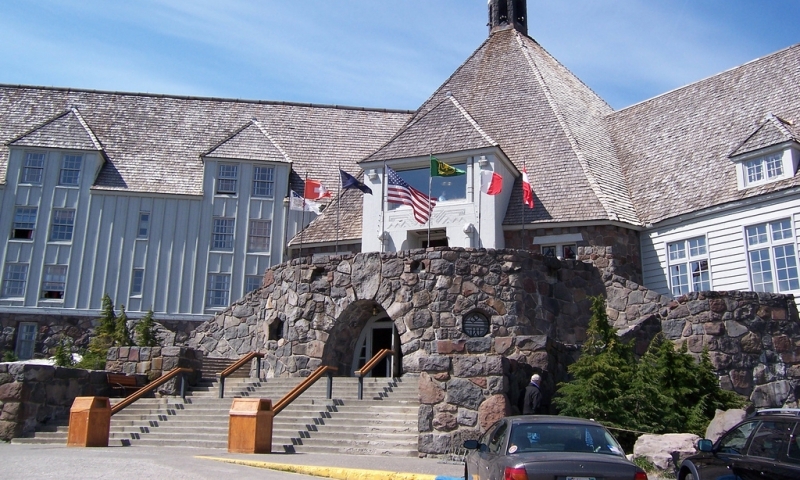 Friends of Timberline is dedicated to preserving and maintaining the historic building of Timberline Lodge at Mt. Hood, Oregon.